Review In A Nutshell: Obsidio was the perfect conclusion to an epic series. If you don’t know anything about the Illuminae Files, it’s an epic sci-fi series told through a dossier of various file types (emails, incident reports, transcribed surveillance footage, etc). It is absolutely amazing, and you need to read it now. Obsidio takes place directly after the events of Gemina, telling the story of the previous protagonists, as well as the story of those who are still on Kerenza IV. It is a fantastic book and exceeded all of my expectations, something I thought wasn’t possible, to be honest. 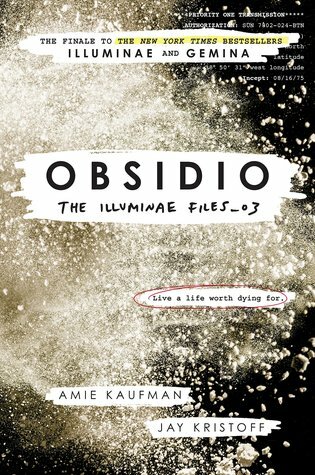 Obsidio continues in the traditional Illuminae Files format and maintains the fast pace and gripping plot of the first two books while maintaining original and unpredictable. The authors continued to surprise me with every twist they throw my way. In addition to the action, this book continued to make me think and really emphasized the themes of morality and what is right. These themes were a big part of Illuminae, but weren’t as prominent in Gemina. Granted, this book had more AIDAN which means, of course, there was more moral philosophizing. The writing style continued to be the perfect balance of hilarious and heartbreaking. I laughed so many times while reading, but I also cried a few times (why did this book have to torture me?!). From start to finish, I was completely absorbed in the world and in the characters. Speaking of the characters, god I love them all. Our previous “heroes” all play major roles in this installment, and they continue to grow and develop over the course of the book. Their romantic relationships were adorable, and the friendships you watch them make are great. Also, I loved the role Isaac Grant played and his relationships with the other characters. The new characters, Asha and Rhys, were good, but nothing groundbreaking. They were fun and you can root for them, but they don’t hold a candle to the previous protagonists. However, I did love Rhys’ perspective, the various soldiers, and how the book further showed BeiTech’s point of view on this whole war. It added another level to this series that I really appreciated. However, AIDAN’s arc in this book was probably my favorite thing about it. AIDAN is just my favorite thing in general. Amie and Jay really created a fascinating character, and I always looked forward to his chapters. “Everyone’s favorite murderous artificial intelligence” stole the show for me, as he always does. I don’t want to spoil anything, so I will just end that bit there. I also loved that they explain how the files themselves were obtained and collected. I honestly wasn’t expecting to see that in this book but I’m glad they mentioned it. Mostly because we got to learn who the video analysts are and now I really want to reread the series with that in mind. Pros – This entire review is basically a list of pros, I feel like adding them here is redundant. Obsidio is a fantastic ending to a fantastic trilogy. This series will always be one of my all-time favorites, and I would recommend it to any sci-fi fan, or anyone looking for an amazing read.